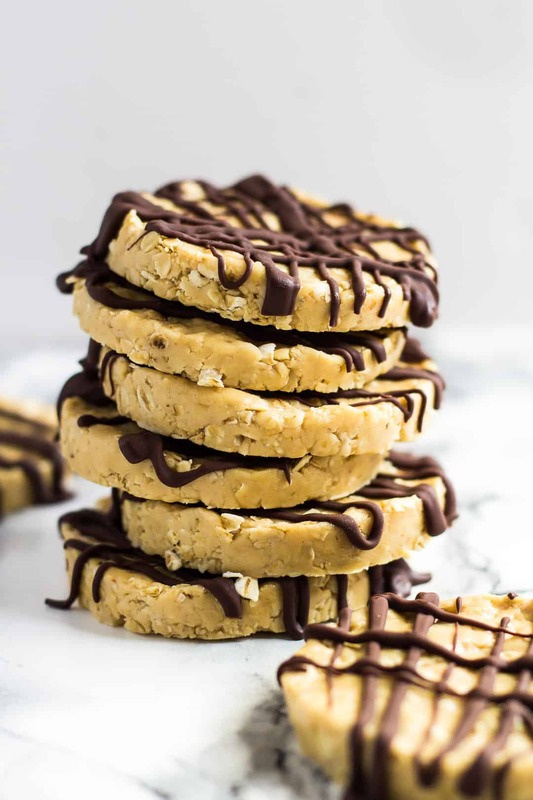 No-Bake Peanut Butter Cookies – These cookies are soft, creamy, loaded with peanut butter flavour, no-bake, and only require 4 simple ingredients to make! 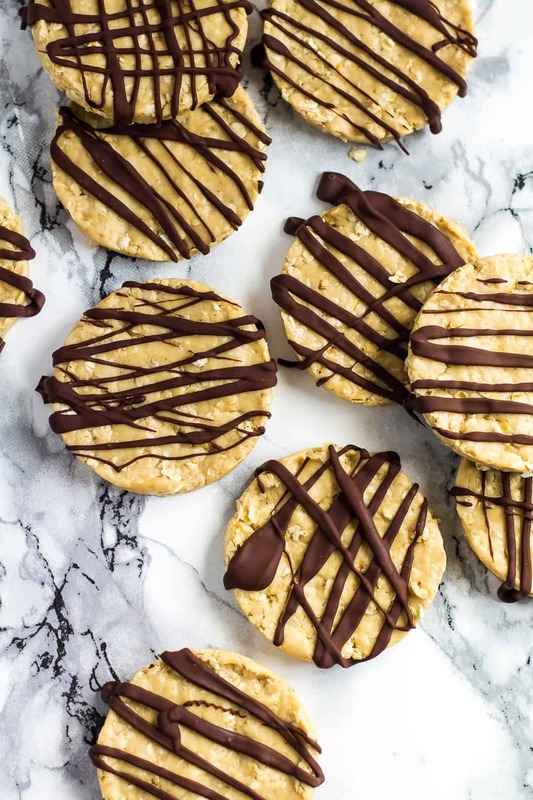 Guys, I have the most easiest cookie recipe for you today, and you are gonna LOVE it. These cookies require no baking and only 4 simple ingredients. Yup. And they are so good! 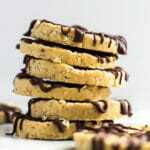 If you’ve tried and loved my 4-Ingredient Peanut Butter Cookies, then you need to make these. Right now. 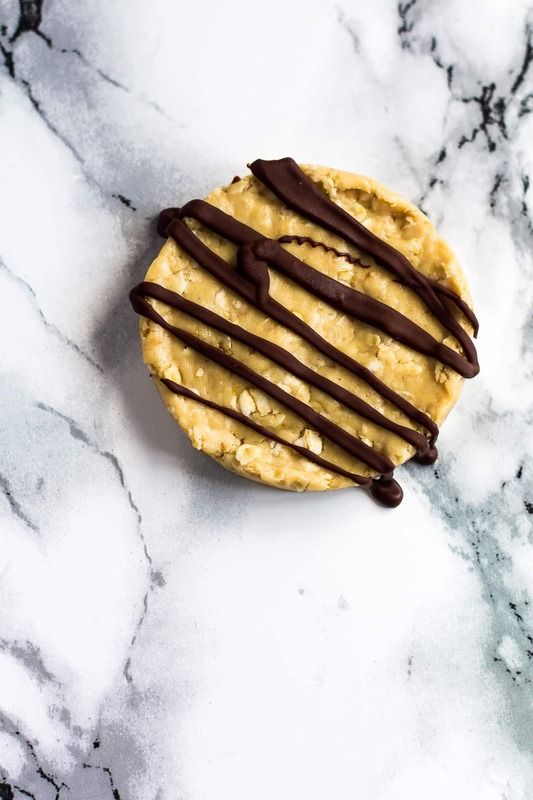 To make these no-bake cookies, simply combine all of the ingredients together in a large bowl. Shape the mixture into circles 2-inch (5cm) wide, 1/2-inch (1cm) thick. I pressed my mixture into a cookie cutter for perfectly shaped circles. Place the cookies onto a baking tray lined with parchment paper and store in the freezer until firm – about 30 minutes. I drizzled my cookies with a little melted chocolate, but that is totally optional. made from only 4 ingredients! 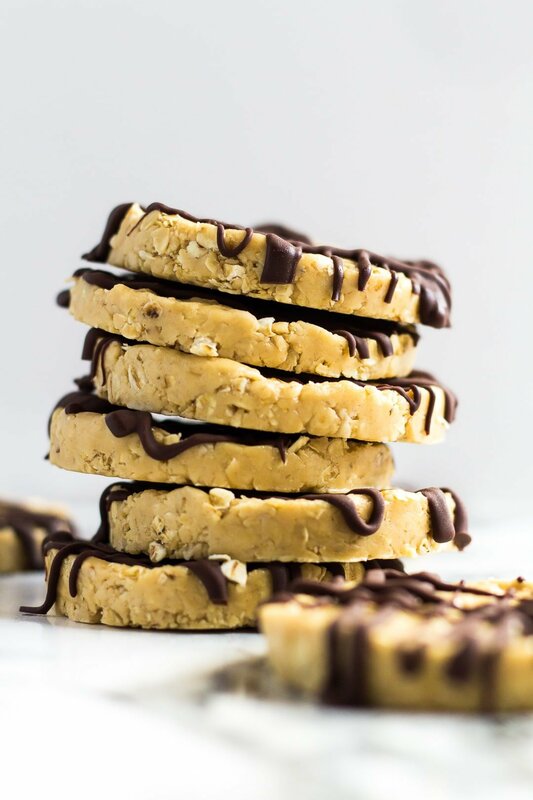 Try these simple no-bake recipes next! 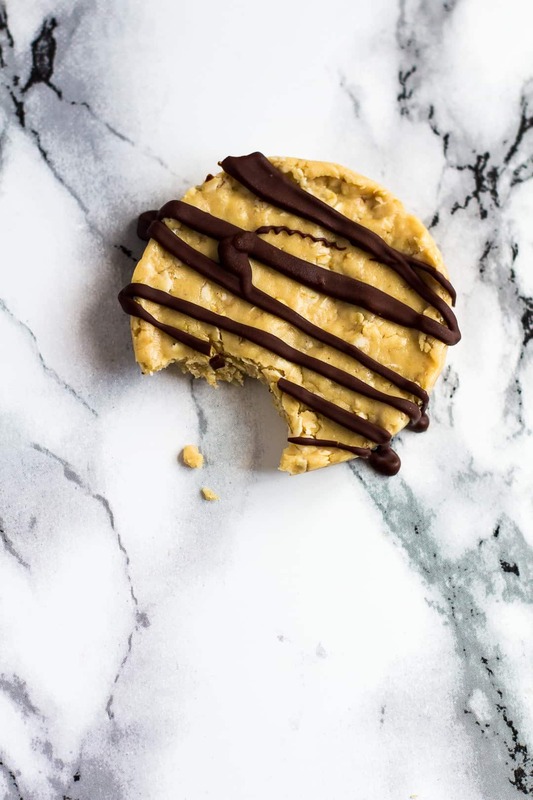 These cookies are soft, creamy, loaded with peanut butter flavour, no-bake, and only require 4 simple ingredients to make! In a large bowl, stir together the peanut butter, oats, icing sugar, and vanilla until completely combined. You may need to use your hands towards the end to gather everything together. Shape the mixture into 2-inch (5cm) wide, 1/2-inch (1cm) thick circles. You should get about 10 -12 cookies. I pressed mine into a cookie cutter to get perfect circles. 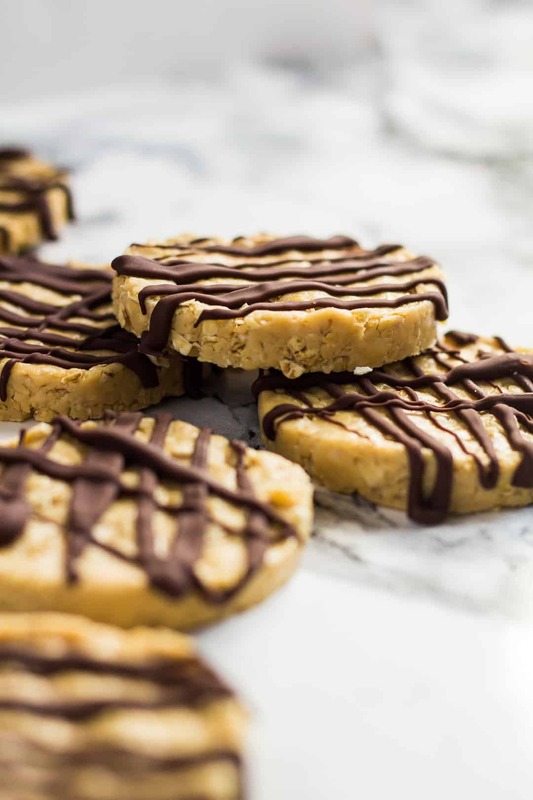 Carefully place the cookies onto a baking tray lined with parchment paper, or silicone mat, and place in the freezer until firm - about 20 - 30 minutes. Drizzle the cookies with melted chocolate, if desired. Cookies should be kept refrigerated in an airtight container. They can also be frozen for up to 1 month. Thaw overnight in the fridge. Whoa. These are almost too good to be true. No oven, allllll the lovin’ for these cookies! I am all over these. Yum!! !